Charles was raised in a traditional Cajun family household in Beaumont, Texas. His parents were Church Point, Louisiana natives and for their wedding celebration and dance, Iry LeJeune provided the entertainment. His parents spoke French around the house when they didn’t want the kids to understand what they were saying, but the kids understood it anyway. Charles’ late cousin, Joe Thibodeaux, owned the Roaid Club in Port Acres, Texas. 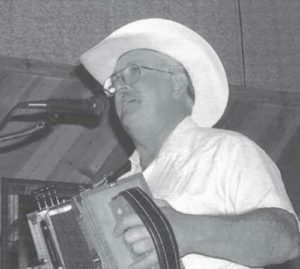 During his youth, he visited the legendary club on a regular basis and was influenced to play the Cajun accordion by watching Andrew Cormier and The Rambling Aces band which included Rodney LeJeune, Dallas Roy, and many other famous Cajun musicians. At age 16, a friend gave him a used accordion that had a couple of keys missing. It had tape over the holes and reeds that wouldn’t play. After saving up his money, he bought an inexpensive Hohner but got side tracked away from his music for many years. After living in Austin a few years, he got lonesome for Cajun music so he formed a traditional Cajun Band in the Spring of 2004 and has since, thrilled audiences throughout the State of Texas. In 2008, Texas Folklife Resources (TFR) sponsored them to play a week-long event at the Smithsonian in Washington, D.C. representing Cajuns from Texas. They have played several festivals sponsored by TFR as well throughout the years. Charles and the Austin Cajun Aces have been the Monday night house band at the Evangeline Cafe in Austin, Texas going on 15 years, playing mostly with Peter Schwarz on fiddle and Steve Doerr on guitar. They are also in the house band playing every 1st Thursday at Austin’s Cypress Grill cafe for the last 12 years. Throughout the year they stay busy playing festivals, parties, and crawfish boils. Charles plays a Poine Noir, Martin, and Poullard accordions. Gary Wayyne Bertrand was born on July 12, 1951 and was the only child of the siblings born in Fort Hood Army base in Texas. His parents Joseph A. Bertrand was from Kaplan, Lousiana and his mother Olita Menard was from Crowley, Lousiana and lived in Abbyville, Lousiana before moving to Texas. Gary’s dad taught him to play the guitar at 13 and he and his dad both learned together at 15 to learn to play the accordian. They played together at Fai Do Dos and house parties and hole in the wall gigs. Gary played in Liberty, Buna and Beaumont, Texas. Gary formed the band Cajun Flavor. In 1980 he fired all his band members after recording a 45 LP under the name of Cajun Flavor then formed a new band “Touch of Cajun” and there blossomed a new cajun band. When forming the band, Gary’s wife Helen was the first woman drummer to play cajun music. If you ever knew Helen she was one of a kind. Gary and Touch of Cajuns has played at the state fair in Austin, Texas. The Governor’s Mansion for Ann Richards while the president of Mexico was visiting at the Governor’s Mansion. Gary played in Hitchcock tees, many benefits, weddings, University of Texas, elks lodge, festivals, Fredericksburg Crawfish Festival, Lubbock, Texas and 5 years for the Mardis Gras in Las Vegas, Nevada. 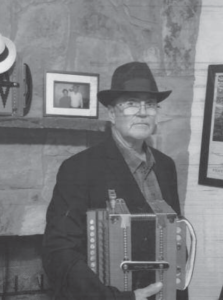 He has played with many musicians, Gino Delafose, Santiago Jemanoz, Rock N Sidney, Aldis Rouge, Rodney Lajuene, David Varado, Gulf Coast Cajun Playboys and many more and was interviewed by the Texas Folklore Festival magazine. Gary Played as the regular and at the Rodair Club in Port Acres. The Rodair was the only Texas dancehall that played Cajun music. Gary currently lives in Nederland, Texas with his daughter Deanna and husband Kenny mings where he spends lots of time with his granddaughter Kenlee.